Soybeans, cultivated for many centuries throughout Asia, are a leading crop in the United States. Soybeans are used primarily to produce protein meal and oil. Soybean, also soy and soya bean, common name for an annual leguminous (see Legume) plant and its seeds. The soybean probably originated in eastern China and is widely cultivated as a farm crop. It is an erect, hairy plant from 0.6 to 1.5 m (2 to 5 ft) in height, with large trifoliate leaves, small white or purple flowers, and short pods with one to four seeds. On maturity, which is reached from 100 to 150 days after planting, depending on variety, location, and weather, the leaves turn yellow and drop, and the pods rapidly become brown and dry. The seeds, which are almost spherical in shape, are usually light yellow, but some rare varieties are black, brown, or green. They have a black, brown, or yellow hilum (seed scar) and contain about 20 percent oil and 40 percent protein. In the United States, soybeans are grown as a row crop, planted in May or June, and harvested with a grain combine in the fall. 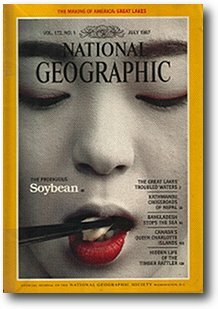 The soybean, an ancient food crop in China, Japan, and Korea, was introduced into the United States in the early 1800s and was grown as a minor forage crop for many years. The development of a soybean-processing industry in the early 1920s gave soybean cultivation a great impetus, and today the soybean is a leading crop in the United States, ranking only behind corn and wheat. The United States produces about 60 percent of the world's soybeans, compared to 14 percent produced by Brazil, 10 percent by China, and lesser percentages by Argentina, Taiwan, Canada, and India. Production in the United States is located chiefly in the Midwest and the lower Mississippi Valley; more than 30 percent of the United States production is exported. The two basic products of the soybean are protein meal and oil. In the United States, more than 90 percent of the oil is consumed as margarine, shortening, mayonnaise, salad oils, and other edible products; the rest is used in industrial products such as paint, varnish, linoleum, and rubber fabrics. Soybean meal is the major source of the protein supplement used in livestock feeds, which utilize 98 percent of the total meal produced. In the protein-short areas of the world and elsewhere, soybean meal is finding increasing use in human food products. Scientific classification: The soybean belongs to the subfamily Papilionoideae, family Fabaceae (formerly Leguminosae). It is classified as Glycine max. Welcome to the Soy and Human Health World Wide Web Home Page, where news, research and additional information on nutritional advantages of soy are reported. 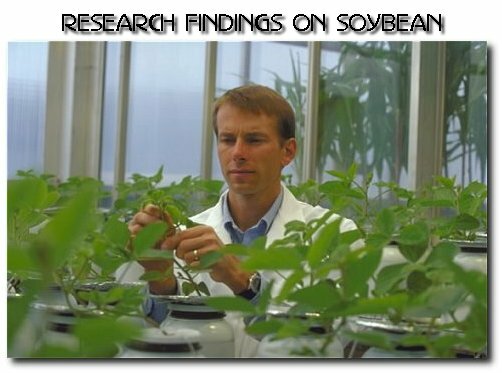 Interest in soyfoods is increasing as scientists uncover substances in the soybean that reduce risk of breast, colon and prostate cancer, lower cholesterol, and prevent osteoporosis and other chronic diseases. Resource: The Illinois Soybean Association and Illinois Soybean Checkoff Board and by StratSoy, a strategic soybean information system supported by the United Soybean Board and developed at the University of Illinois. Great news for women and breast cancer comes from researchers in Perth, Australia. They have found that phyto-oestrogens found in soy, whole grains, fruits, vegetables, and flax seed contain naturally occurring chemicals: phytoestrogens. These are similar to the female hormone: estrogen. It has long been known that women in China and Japan have less chance of breast and uterine cancer. A U.S. study also recently discovered that you can reduce your chances of uterine cancer by 54 percent if you eat soy and tofu. Bodyatlas� is intended to heighten your awareness of health information. Visit their Website. You can reduce your chances of uterine cancer by 54 percent if you eat soy and tofu. If you're wondering why, you're part of the group of scientists who have been puzzled for years. It has long been known that women in China and Japan have less chance of breast and uterine cancer. Now researchers believe the answer is in their diet. Soy and tofu are rich in phytoestrogens. These natural plant hormones somehow affect our health and experts recommend diets low in calories, and rich in legumes, whole grain foods, vegetables, and fruits. Osteoporosis is a reduction in bone tissue resulting in brittle and fragile bones prone to fracture, usually occurring in postmenopausal women and elderly men (due to hormonal changes or a deficiency of calcium or vitamin D). In the first 3-5 years after menopause, women lose 3-5% of their bone mass per year. After about 10 years, bone loss tapers off only to increase again after the age of 80 (1). Isoflavones in soy (genistein and daidzein) have been found to have a modest positive effect on bone tissue in a few animal studies and two human studies. This area of research is quite new and several other human studies are currently underway. The Second International Symposium on the Role of Soy in Preventing and Treating Chronic Disease was held in September of 1996. Several animal studies performed on ovariectomized rats addressed the issue of isoflavones and bone loss. One study found that isoflavones prevented but did not reverse or restore bone loss (2). Another found that genistein, at an optimal dose, resulted in retention of bone mineral mass equivalent to physiologic dose of estradiol, possibly by acting as an agonist on estrogen receptors in bone tissues. Genistein may also effect other enzymes in bone cells, such as alkaline phosphatase (3). A third study suggested that genistein inhibits osteoclasts, cells that function in the removal of bone tissue and are dependent on the enzyme tyrosine kinase, by inhibiting its activity (4). A fourth study found that treatment with 5 and 25mg, but not 1mg, of genistein decreased loss of bone mineral density and volume and concluded that the effect of genistein is via stimulation of bone formation and not suppression of bone resorption, as in the case of estrogens (5). Two human studies found significant increases in bone mineral content in the isoflavone consuming group. The first study, done at the University of Illinois at Urbana-Champaign, involved 66 post-menopausal women, who consumed 40g per day of isolated soy protein containing either 55mg or 90mg of isoflavones for a six-month period. Those women consuming the higher level of isoflavones had an increase in bone mineral density and bone mineral content in the lumbar spine (6). In the second study, done in Australia and involving 52 post-menopausal women, those who consumed 45g of soy grits per day for a 12-week period also had a significant increase in bone mineral content in the lumbar spine (7). Abstracts from the meeting can be found at www.soyfoods.com. More recently, John J.B. Anderson published a review entitled "The Effects of Phytoestrogens on Bone" in the journal Nutrition Research. His review, which covered published reports of epidemiological and experimental studies of humans, animal models, isolated tissues and cells in culture, concluded that isoflavones (particularly genistein and daidzein), at optimal doses, result in improved bone mass (8). Many people ask what amount of soy they should consume daily to protect them against bone loss. The research is still quite new and thus it is impossible to recommend a specific amount, but it is a good idea to eat soy products daily instead of taking isoflavone supplements, as it is not entirely clear at the time if isoflavones are entirely responsible for the beneficial effects. In general, for protection against osteoporosis, adult women should make sure they get enough calcium and Vitamin D in their diet and engage in weight-bearing exercise daily. In August of 1997 the Institute of Medicine of the National Academy of Sciences issued a report stating that both men and women ages 19-50 should consume 1,000 mg of calcium per day and those over 50 years should consume 1,200 mg per day (9). Some people have asked if calcium and soy can be taken together. Some plants, like soy, contain substances such as phytate and oxalate that bind minerals such as calcium which prevents or reduces absorption. However, bioavailability data on calcium indicate that absorption from tofu and soy is similar to milk. Also, soy is relatively high in calcium. 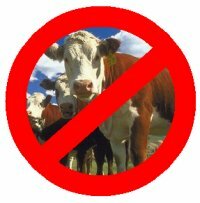 Thus, it is fine to take calcium supplements with soy products. References 2-7 all presented at the Second International Symposium on the Role of Soy in Preventing and Treating Chronic Disease, Belgium, September, 1996. 1.Cauley J. Hormone replacement therapy and osteoporosis. Soy Connection 1997;5:2. 2.Arjmandi BH, Gettlinger MJ, Goyal NV, Birnbaum IR. A soy protein-containing diet prevents bone loss due to ovarian hormone deficiency. 3.Anderson JJB, Garner SC, Ambrose WW, Ohue T. Genistein and bone: studies in rat models and bone cell lines. 4.Blair HC. Action of genistein and other tyrosine kinase inhibitors in preventing osteoporosis. 5.Fanti O, Faugere MC, Gang Z, Schmidt J, Cohen D, Malluche HH. Systematic administration of genistein partially prevents bone loss in ovariectomized rats in a non-estrogen-like mechanism. 6.Erdman Jr. JW, Stillman RJ, Lee KF, Potter SM. Short-term effects soy soybean isoflavones on bone in postmenopausal women. 7.Dalais FS, Rice GE, Bell RJ, Murkies AL, Medley G, Strauss BJG, Wahlqvist ML. Dietary soy supplementation increases vaginal cytology maturation index and bone mineral content in postmenopausal women. 8.Anderson JJB, Garner SC. The effects of phytoestrogens on bone. Nutr Res 1997;17:1617-1632. 9.Dietary Reference Intakes: Calcium, Phosphorus, Magnesium, Vitamin D, and Fluoride. Institute of Medicine of the National Academy of Sciences, 1997. Hot flushes, night sweats, mood changes, loss of libido and vaginal dryness are some of the most common symptoms of menopause. Hormone Replacement Therapy (HRT), which is presently used to treat menopausal symptoms and reduce the risk of osteoporosis and heart disease, poses the problem of an increased risk of breast cancer. Women who currently undergo HRT have a 60% reduced risk for wrist fractures, a 40% reduced risk for hip fractures and a 35% reduced risk of all non spinal fractures when compared to women who choose not to undergo HRT (1). The phytoestrogens in soy, which are similar in structure to the estrogen we produce in our bodies, may reduce menopausal symptoms and thus may be an alternative to HRT (2). At the "Second International Symposium on the Role of Soy in Preventing and Treating Chronic Disease," which was held in Brussels, Belgium in September, 1996, there were six human studies that looked at the role of soy in reducing post-menopausal symptoms, especially hot flushes. Although all six found at least a slight decrease in the rate of hot flushes, only 3 found a significant decrease. Of the three studies with no significant results, the first, done at the Bowman Gray School of Medicine of Wake Forest University in North Carolina using 51 peri-menopausal women over a 6 week period, found slight improvements in menopausal symptoms and improvements in cholesterol and blood pressure using a soy protein isolate supplement (3). The second study, done at Tufts University School of Medicine in Boston, MA found a small decrease in symptoms by the women consuming a soy bar with 40mg of phytoestrogen for 12 weeks (4). The third study done in Australia used 52 postmenopausal women. The soy group was fed 45g of soy grits per day and though the decrease in hot flushes was not enough to be significant, there was a significant improvement in vaginal cytology (5). Of the three studies that did find significant results, the first, which was also done in Australia, consisted of 58 postmenopausal women. There was a 40% reduction in hot flushes in the group consuming 45g of soy flour per day over a twelve week period. This study was previously published in the journal Maturitas in1995 (6). A second study, done at the Royal Hospital for Women in Australia, consisted of 9 women who consumed 160mg of isoflavones for 12 weeks and had a significant decrease in the number of hot flushes from 6.7 to 3.4 per day (7). The final study, done in the United Kingdom, fed the soy group 80mg of isoflavones for 2 months and found a significant decrease in the rate of hot flushes (8). Abstracts from these studies can be accessed on the world wide web at www.soyfoods.com. A more recent study conducted in Italy using 104 postmenopausal women found a significant reduction (45% vs 30% for the placebo) in the number of hot flushes after 12 weeks in the group consuming 60g daily of soy protein isolate containing 76mg of isoflavones (9). Hot flushes are uncommon in women from countries where the consumption of soy products is high, such as Asian countries (10). In fact, there is no precise Japanese word to describe a hot flush. In one study, Japanese women reported much fewer night sweats and hot flushes than Canadian women (11). Another study found that urinary excretion of isoflavonoids in Japanese women was 100 to 1000 times higher than in American and Finnish women and that the high consumption of soy products may partly explain why Japanese women report having fewer hot flushes (12). In summary, soy isoflavones may be useful in women with mild to moderate post-menopausal symptoms, and in preventing bone loss, but it is too early to tell whether soy can completely replace HRT. One to four servings of soy per day may be effective in reducing symptoms, but more research needs to be done in order to know how much soy to recommend. In regards to the decision of whether to undergo hormone replacement therapy or not, women need to consider their individual risk factors of osteoporosis, heart disease and especially breast cancer and discuss them with their doctor in order to make an appropriate decision. References 3-8 all presented at the Second International Symposium on the Role of Soy in Preventing and Treating Chronic Disease, Belgium, September, 1996. 1.Cauley JA, Seeley DG, Ensrud K, Ettinger B, Black D, Cummings SR. Estrogen replacement therapy and fractures in older women: a prospective study. Ann Intern Med 1995;122 :9-16. 2.Dalais FS. Soy and Menopause. Soy Connection 1997;5:1,4. 3.Burke GL. The potential use of a dietary soy supplement as a post-menopausal hormone replacement therapy. 4.Woods MN, Senie R, Kronenberg F. Effect of a dietary soy bar on menopausal symptoms. 5.Dalais FS, Rice GE, Bell RJ, Murkies AL, Medley G, Strauss BJG, Wahlqvist ML. Dietary soy supplementation increases vaginal cytology maturation index and bone mineral content in postmenopausal women. 6.Murkies AL, Lombard C, Strauss BJG, Wilcox G, Burger HG, Morton MS. Dietary flour supplementation decreases post-menopausal hot flushes: Effect of soy and wheat. Maturitas 1995;21:189-195. 7.Eden J, Knight D, Mackey R. Hormonal effect of isoflavones. 8.Harding C, Morton M, Gould V, McMichael Phillips D, Howell A, Bundred NJ. Dietary soy supplementation is oestrogenic in menopausal women. 9.Albertazzi P, Pansini F, Bonaccorsi G, Zanotti L, Forini E, De Aloysio D. The effect of dietary soy supplementation on hot flushes. Obstet Gynecol 1998;91:6-11. 10.Boulet MJ, Oddens BJ, Lehert P, Vemer HM, Visser A. Climacteric and menopause in seven southeast Asian countries. Maturitis 1994;19:157-176. 11.Lock M. Contested meaning of the menopause. The Lancet 1991; 337:1270-1272. 12.Adlercreutz H, Hamalainen E, Gorbach S, Goldin B. Dietary phyto-oestrogens and the menopause in Japan. Lancet 1992;339:1233. Tthe FDA has authorized use of health claims about the role of soy protein in reducing the risk of coronary heart disease (CHD) on labeling of foods containing soy protein. This final rule is based on the FDA's conclusion that foods containing soy protein included in a diet low in saturated fat and cholesterol may reduce the risk of CHD by lowering blood cholesterol levels. Recent clinical trials have shown that consumption of soy protein compared to other proteins such as those from milk or meat, can lower total and LDL-cholesterol levels. Our intent is to promote the consumption of soyfoods throughout the world using: reliable, scientifically-based information about health benefits, taste-tested recipes that include nutritional information, and other resources for consumers, dietitians, journalists, scientists and soyfoods companies. Every effort has been made to insure that the information provided in the U.S. Soyfoods Directory is accurate. The information reflects the latest information available to the publisher, which is not liable for errors or omissions. If you find information that you believe is incorrect, please call the editors at (317) 926-6272. A company, product or service listing in the U.S. Soyfoods Directory does not imply or constitute an endorsement or promotion of any company, product or service listed by the publisher. The U.S. Soyfoods Directory is published by the Indiana Soybean Board, 5757 W 74th St, Indianapolis, Indiana 46278-1755. Heilongjiang Soya offers you the best soybean beverage with all the nutritional goodness as mentioned in the research above. The price is only RM17 per pack. You may place your orders by sending an email to us (see below) or calling Malaysia 04-659 9844, mobile 012 429 9844. Explore a Business Opportunity with Heilongjiang Soya. Learn about the nutritional value of soybeans. View the Heilongjiang Soya Gallery. The information contained in this website is general and not specific to any individual. It is only for reference and education purposes. Do not self-diagnose or attempt self-treatment for serious or long-term problems without first consulting a qualified practitioner, preferably one who is familiar with soya products and alternative medicine. Heilongjiang Soya is the trade mark of Country Food & Beverages. ©2000 Country Food & Beverages.